I always say you’ve gotta use the right tool for the job, but did you know there’s a right cord for every tool? You need a cord that, when fully extended, is the right gauge and length for your job. 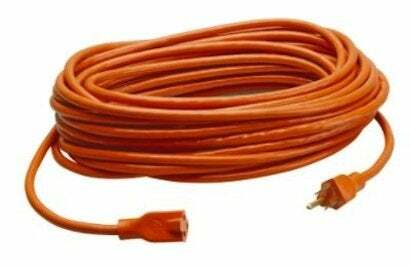 A cord that’s still coiled can start to act like a transformer under heavy loads and can dangerously overheat. This is especially common with smaller-gauge cords. Look for grounded cables that are labeled UL- and OSHA-approved so you can be sure they’ve been tested and found to be safe. And although it’s more expensive, go for a thicker gauge. Twelve-gauge cable is okay if you’re only using one power tool, but for multiple tools or for outdoors, 10-gauge is best. Electrical power dissipates after the first 100 feet and insufficient amperage can burn out your tools. For cords you use a lot in the same place, install a wall-mounted cord reel near an outlet. Try a portable spring-rewind wheel for long cords to save you time and hassle on the job.